Bonita Pastor is set in a quiet peaceful location,yet only a five minute walk from an endless choice of excellent restaurants and bars(known as the golden mile) and ten minutes from three beaches. Just a 10 minute walk away is the new La Zenia Boulevard, one of the largest shopping centres in Europe.Ideal for families and golfers this holiday home is perfectly positioned between Torrevieja and Benidorm in the north and La Manga and Cartegena in the south.This apartment benefits from Wi - Fi (Fibre optic 20 GB), Satalite TV, air con, a communal pool with a separate baby and toddler section, an enclosed childrens play area, three private patios with outside dining facilities.It's fully furnished throughout in pine,with one double and one twin bedroom. We have had this apartment since 2005. Initially we used it for our holidays, but after a few years decided to let it out. 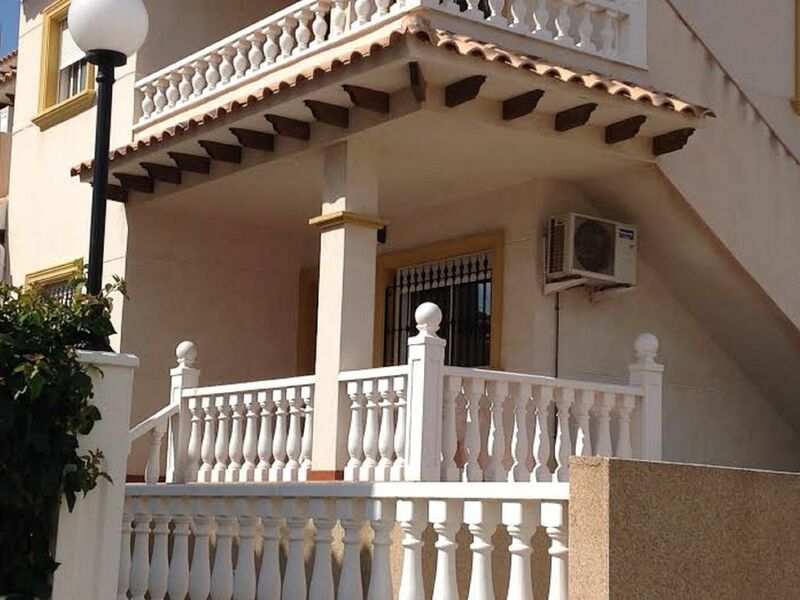 I think the best thing about our apartment, Bonita Pastor, is that although it's situated in a very quiet and tranquil area, just 10 minutes away is the vibrant night life of the Cabo Roig strip. Our neighbours, some of whom live there, are all lovely. You really don't require a car as everything is within walking supermarkets, beaches, bars and restaurants. All the usual items plus a king size double sofa bed with memory foam mattress. Includes hundreds of channels in English, Spanish, German and French. Variety of children's games and toys for the pool. Front veranda with table and chairs, ideal for dining out. Back and side patios. Tennis courts just a ten minute walk away. There's a choice of three great golf courses all within a ten minute drive. ( Villamartin, Campomoar and Las Ramblas). There are only 5 short steps to climb. Literally a 1 minute walk. Our property manager, Anna, speaks fluent Spanish and delivers airport transfers, if required. Very clean apartment very close to everything you need, David was very helpful and polite made us felt welcome straight away. Thankyou for your hospitality. Highly recommended. We had a very pleasant stay. The apartment was very nice, well equipped and clean. No noise from the outside and the beds were comfortable. Thank you David for having us. Good accommodation and the owners very helpful. We enjoyed our stay, the appartment was very clean and the owners were so helpful. Nothing was too much trouble for the owners and we would stay in their accommodation on any other occasion. A real pleasure and we look forward to our next visit. Had a lovely holiday, the apartment had everything we needed and was very comfortable. Would recommend this holiday home. Anna was great. Thanks for the use of your holiday home. The apartment was nice and compact, with plenty of space for two . We do not drive so it was a bit further out than we expected, however this did not stop us from walking to the beautiful beach at La Zenia and the strip at Cabo Roig. If we were to make any comments in a way that may help in future it would be ...That we found one bath towel and one hand towel was not really enough when you are showering twice a day ( however there is a washing machine but did not feel that it warranted us using it for the towels, and although we could always dry the towels due to the hot sunshine we would have liked to have a change . There is a safe in the apartment which would have been great if it was not broken !.we bought six small glasses that we used as egg cups, and the only other small thing is that the small frying pans could do with replacing .....Having said all this we had a lovely time and the Host was extremely helpful in helping us arrange transfers through someone who looks after the apartment , for which we were very grateful. The comments made are not a negative impact on the overall stay, they were just our opinion and hope it will be taken as they are meant. Thank you for your kind words, it was a pleasure to have you and your family as our guests. Anna and I do our very best to maintain a high standard of customer care. There is a cleaning charge of 60 - 80 Euros (depending on number of guests), which should be paid to my property manager during your stay.